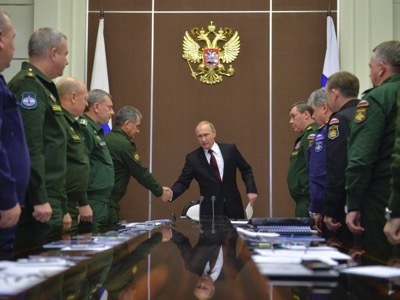 Russian Defense Minister Sergei Shoigu has told a security conference in Moscow that an April 20 meeting of the NATO-Russia Council — the first in more than two years — “did not inspire optimism” about the Kremlin’s relations with NATO and the European Union. Shoigu made the remarks on April 27 at the Fifth Moscow Conference on International Security, which was being hosted by Russia’s Defense Ministry. NATO unilaterally suspended practical cooperation with Russia on April 1, 2014, in response to Russia’s military intervention in Ukraine and its illegal annexation of Ukraine’s Crimean Peninsula. The NATO-Russia Council had been set up in 2002 for handling security issues and joint projects, including nuclear nonproliferation and cooperation against terrorism and international drug smuggling. The April 20 meeting of the NATO-Russia Council was the first of its kind since April 2014. Russian Foreign Minister Sergei Lavrov was scheduled to meet on April 27 with Lamberto Zannier, the secretary-general of the Organization for Security and Cooperation in Europe (OSCE). The two were expected to discuss the activities of the OSCE’s Special Monitoring Mission to Ukraine, which monitors the cease-fire agreement that is part of the Minsk accords. Zannier has suggested that he and Lavrov also could discuss Russia’s relations with NATO and the EU. Meanwhile, Iranian Defense Minister Hossein Dehghan was scheduled to meet with Shoigu on the sidelines of the security conference. Reports said the two would discuss Tehran’s possible purchase of warplanes and tanks from Russia. While Russia is increasingly mistrustful of the West it is working much more closely with traditional western adversaries like Iran. Obviously this is no coincidence and the recently forged military cooperation agreement with Iran is the outcome. Russia and Iran are forging a closer military alliance in anticipation of further and possibly direct confrontation with the West. Ed.